Ogden /ˈɒɡdən/ is a city and the county seat of Weber County, Utah, United States, approximately 10 miles (16 km) east of the Great Salt Lake and 40 miles (64 km) north of Salt Lake City. The population was 84,316 in 2014, according to the US Census Bureau, making it Utah's 7th largest city. The city served as a major railway hub through much of its history, and still handles a great deal of freight rail traffic which makes it a convenient location for manufacturing and commerce. Ogden is also known for its many historic buildings, proximity to the Wasatch Mountains, and as the location of Weber State University. 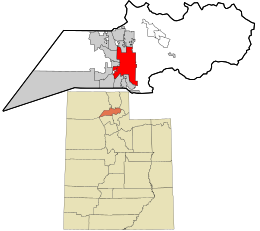 Ogden is a principal city of the Ogden–Clearfield, Utah Metropolitan Statistical Area (MSA), which includes all of Weber, Morgan, Davis, and Box Elder counties. The 2010 Census placed the Metro population at 597,159. In 2010, Forbes rated the Ogden-Clearfield MSA as the 6th best place to raise a family. Ogden has had a sister city relationship to Hof (Germany) since 1954. Originally named Fort Buenaventura, Ogden was the first permanent settlement by people of European descent in what is now Utah. It was established by the trapper Miles Goodyear in 1846 about a mile west of where downtown Ogden sits today. In November 1847, Captain James Brown purchased all the land now comprising Weber County together with some livestock and Fort Buenaventura for $3,000. The land was conveyed to Captain Brown in a Mexican Land Grant, this area being at that time a part of Mexico. The settlement was then called Brownsville, after Captain James Brown, but was later named Ogden for a brigade leader of the Hudson's Bay Company, Peter Skene Ogden, who had trapped in the Weber Valley a generation earlier. There is some confusion about which "Ogden" was the first to set foot in the area. A Samuel Ogden traveled though the western United States on an exploration trip in 1818. The site of the original Fort Buenaventura is now a Weber County park. Ogden is the closest sizable city to the Golden Spike location at Promontory Summit, Utah, where the First Transcontinental Railroad was joined in 1869. It was known as a major passenger railroad junction owing to its location along major east–west and north–south routes, prompting the local chamber of commerce to adopt the motto, "You can't get anywhere without coming to Ogden." Railroad passengers traveling west to San Francisco from the eastern United States typically passed through Ogden (and not through the larger Salt Lake City to the south). However, Amtrak, the national passenger rail system, no longer serves Ogden. Passengers who want to travel to and from Ogden by rail must travel via FrontRunner commuter rail to Salt Lake City and Provo. In 1972, The Church of Jesus Christ of Latter-day Saints completed construction of and dedicated the Ogden Utah Temple in Ogden. The temple was built to serve the area's large LDS population. In 2010, the LDS Church announced they would renovate the Ogden Temple and the adjacent Tabernacle. The work which began in 2011 includes an update to the exterior, the removal of the Tabernacle's steeple to make the Temple's steeple a main focus and a new underground parking garage and gardens. The Temple was rededicated in 2014. Because Ogden has historically been Utah's second largest city, it is home to a large number of historic buildings. However, by the 1980s, several Salt Lake City suburbs and Provo had surpassed Ogden in population. The Defense Depot Ogden Utah operated in Ogden from 1941 to 1997. Some of its 1,128 acres (456 ha) have been converted into a commercial and industrial park called the Business Depot Ogden. Ogden is located at 41°13′11″N 111°58′16″W﻿ / ﻿41.2196°N 111.9712°W﻿ / 41.2196; -111.9712 (41.2196, −111.9712), at the foot of the Wasatch Mountains. According to the United States Census Bureau, the city has an area of 26.6 square miles (69.0 km2), all land. Elevations in the city range from about 4,300 to 5,200 feet (1,300 to 1,600 m) above sea level. The Ogden and Weber Rivers, which originate in the mountains to the east, flow through the city and meet at a confluence just west of the city limits. Pineview Dam is in the Ogden River Canyon 7 miles (11 km) east of Ogden. The reservoir behind the dam provides over 110,000 acre feet (140,000,000 m3) of water storage and water recreation for the area. Prominent mountain peaks near Ogden include Mount Ogden to the east and Ben Lomond to the north. Ogden experiences a dry summer continental climate (Köppen climate classification Dsa). Summers are hot and dry, with highs frequently reaching 95 °F (35 °C), with a few days per year reaching 100 °F (38 °C). Rain is provided in the form of infrequent thunderstorms during summer, usually between mid-July and mid-September during the height of monsoon season. The Pacific storm season usually lasts from about October through May, with precipitation reaching its peak in spring. Snow usually first occurs in late October or early November, with the last occurring sometime in April. Winters are cool and snowy, with highs averaging 37 °F (3 °C) in January. Snowfall averages about 40 inches (1.0 m), with approximately 21.98 inches (558 mm) of precipitation annually. Extremes range from −16 °F (−27 °C), set on January 26, 1949, to 106 °F (41 °C), set on July 14, 2002. As of the census of 2000, there were 77,226 people, 27,384 households, and 18,402 families residing in the city. The population density was 2,899.2 people per square mile (1,119.3/km2). There were 29,763 housing units at an average density of 1,117.4/sq mi (431.4/km2). The racial makeup of the city was 79.01% White, 2.31% African American, 1.20% Native American, 1.43% Asian, 0.17% Pacific Islander, 12.95% from other races, and 2.93% from two or more races. Hispanic or Latino of any race were 23.64% of the population. There were 27,384 households out of which 35.2% had children under the age of 18 living with them, 48.4% were married couples living together, 13.1% had a female householder with no husband present, and 32.8% were non-families. 26.2% of all households were made up of individuals and 9.6% had someone living alone who was 65 years of age or older. The average household size was 2.73 and the average family size was 3.32. In the city, the population was spread out with 28.8% under the age of 18, 14.6% from 18 to 24, 29.0% from 25 to 44, 16.3% from 45 to 64, and 11.3% who were 65 years of age or older. The median age was 29 years. For every 100 females, there were 102.3 males. For every 100 females age 18 and over, there were 100.5 males. The median income for a household in the city was $34,047, and the median income for a family was $38,950. Males had a median income of $29,006 versus $22,132 for females. The per capita income for the city was $16,632. About 12.6% of families and 16.5% of the population were below the poverty line, including 20.2% of those under age 18 and 9.3% of those age 65 or over. As of the census of 2010, there were 82,825 people residing in the city. The population density was 2,899.2 people per square mile (1,119.3/km2). There were 29,763 housing units at an average density of 1,117.4/sq mi (431.4/km2). The racial makeup of the city was 75.02% White, 2.24% African American, 1.40% Native American, 1.20% Asian, 0.3% Pacific Islander, 3.7% from other races, and 3.7% from two or more races. Hispanic or Latino of any race were 23.64% of the population. 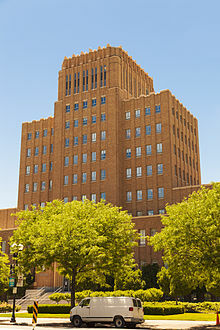 Ogden is governed under the mayor-council form of government, in which the full-time mayor serves as executive while the seven-member part-time council serves as the legislative branch. All these elected officials serve four-year terms, with elections occurring in odd-numbered years and terms beginning in January of even-numbered years. The mayor is Mike Caldwell, who took office in January 2012. The city council members are Marcia White, Richard Hyer, Bart Blair, Ben Nadolski, Luis Lopez, Angela Choberka, and Doug Stephens. Four of the council members represent the city's four municipal districts, while the other three (Lopez, White, and Blair) are elected at-large by voters from the entire city. The Ogden City government operates on a budget of $190 million per year and employs nearly 600 full-time workers. In addition to providing the usual municipal services, the government promotes business and economic development. The city operates a redevelopment agency (RDA), with the city council acting as the RDA governing board and the mayor as its executive director. The RDA's activity has increased since its establishment in 1969, with tax increment revenues at about $10 million per year and an outstanding debt of over $50 million. Designated redevelopment districts now cover nearly all of Ogden's central business districts, as are Business Depot Ogden and several other industrial areas in the western parts of the city. Much of the recent political discourse in Ogden has focused on controversial government-sponsored development projects in the downtown area, including the Ogden Eccles Conference Center, Lindquist Field, The Junction, the Ogden River Project, and other proposals that have not moved forward. A proposed streetcar connecting downtown to Weber State University has attracted considerable attention but only limited support. A major controversy flared up in 2005–07 when the mayor and many others pushed unsuccessfully for construction of a luxury residential development on public land in Ogden's foothills and a new ski resort in the mountains above the city, to be accessed by a pair of aerial gondolas. Other local political concerns include Ogden’s relatively high tax and utility rates, efforts to fight crime, allegations of government corruption, and challenges facing the Ogden City schools. MarketStar headquarters in Ogden, Utah. 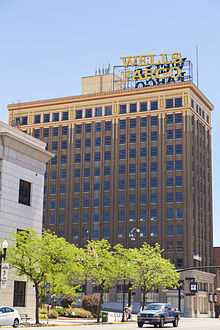 Bank of Utah was founded in Ogden in 1952 and maintains its corporate headquarters in Ogden. As the principal city of the 2nd largest MSA in Utah, Ogden serves as an economic hub for the northern part of the state. Much of the central city is occupied by offices of federal, state, county, and municipal government entities. The Internal Revenue Service has a large regional facility in Ogden and is the city's largest employer with over 5,000 employees. Other large employers include McKay Dee Hospital, Weber State University, Ogden City School District, Autoliv, Fresenius, and Convergys. In 2013, Ogden ranked No. 16 on Forbes' list of the Best Places for Business and Careers. The western parts of the city have several industrial areas. The largest is Business Depot Ogden, a former Army depot that was restructured to be a 1,000-plus acre business park. MarketStar – Sales and marketing company. Autoliv North America – Automotive safety equipment. 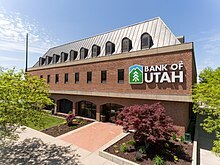 Bank of Utah – Banking services. America First Credit Union – Banking services. Interstates 15 and 84 serve the city. I-84 runs east–west through the southern suburbs, merging with I-15 near Riverdale. I-15 runs north–south near the city's western edge and provides connections to the rest of the Wasatch Front and beyond. Ogden is served directly by exits 341, 342, 343, and 344. US-89 enters the city from the south, running through the city as Washington Boulevard, which serves as the main street of Ogden. It then continues north to Brigham City. State Route 39 runs east–west through the city as 12th Street, and continues eastward through Ogden Canyon providing access to Pineview Reservoir and the mountain and ski resort town of Huntsville. The Utah Transit Authority (UTA) operates four bus routes directly between Salt Lake City and Ogden, as well as numerous others that serve Weber and northern Davis counties that connect into either the Ogden Intermodal Hub on the west edge of town or to Weber State University. Ogden is also the source of the two routes that serve Brigham City, the northernmost extension of UTA's bus system. It also has a Greyhound bus stop along a line that runs north–south along I-15. The FrontRunner commuter rail runs between Salt Lake City and Pleasant View, just north of Ogden, and includes a stop at the Ogden Intermodal Hub. This line opened for service on April 26, 2008. Amtrak service is provided with a bus connection running to/from Salt Lake City, where there are daily California Zephyr trains west to the Oakland, California area and east to Chicago, Illinois. Amtrak trains do not serve Ogden directly. 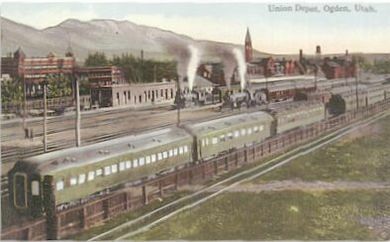 Historically, Ogden Union Station served as a hub for frequent trains going northwest to Portland, Oregon and Seattle, Washington, and east to Chicago. Amtrak ended the Pioneer in 1997. In the same year Amtrak ended the Los Angeles to Chicago Desert Wind. Ogden-Hinckley Airport, Utah's busiest municipal airport, is in the southwest portion of the city. Allegiant Air offers commercial service from Ogden to Phoenix and Mesa, Arizona]. Utah Airways offers charter service to many of the West’s national parks. The First Security Building on 24th Street. The mountains and rivers near Ogden offer many opportunities for outdoor recreation. An extensive trail system, immediately adjacent to the city's eastern edge, gives residents and visitors immediate access to the foothills of the Wasatch Range. The foothill trails are used for hiking, running, mountain biking, and sometimes snowshoeing and cross-country skiing. Steeper trails climb eastward into the mountains, and many other mountain trails originate within a few miles of the city. A system of paved urban trails runs along the banks of the Ogden and Weber Rivers. The quartzite cliffs above Ogden's foothills provide a variety of rock climbing routes. An extensive boulder field in the foothills is one of the most popular bouldering sites in the state. On the mountains east of Ogden are three downhill ski areas: Snowbasin, Powder Mountain, and Wolf Mountain. Popular sites for cross-country skiing include Snowbasin and Weber County's North Fork Park. Kayaking is a popular sport on portions of the Ogden and Weber Rivers. A developed kayak park lies on the Weber River in the western portion of the city. The reservoirs near Ogden are used for a wide variety of water sports. Ogden is also home to the minor league baseball team Ogden Raptors of the Pioneer League, the Women's Flat Track Derby Association league Junction City Roller Dolls, the minor-league soccer team Ogden City SC of the United Soccer League, the junior hockey team Ogden Mustangs of the Western States Hockey League and the Ogden Knights of the American Indoor Football Association. Ogden Stadium houses the annual "Hot Rocking 4th", a motorsports event. There are several golf courses in the city of Ogden. 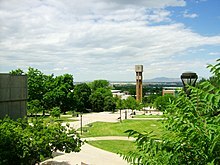 Weber State University fields several intercollegiate athletic teams that attract spectators from among local residents. The university is especially known for its basketball team. 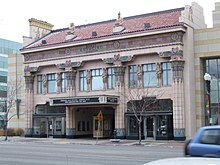 Ogden is a satellite venue of the Sundance Film Festival. A local film festival, now called the Foursite Film Festival, has been held annually since 2004. Other events of interest include a downtown farmer's market, the Ogden Arts Festival, the Harvest Moon Festival, Ogden Winterfest and the Ogden Marathon. Ogden has had two shopping malls. Newgate Mall was built in 1981, and Ogden City Mall a year prior. The latter was torn down and redeveloped as The Junction. Two ships in the United States Navy have been named after the City of Ogden; the first, USS Ogden (PF-39), in 1943, and the second, USS Ogden (LPD-5), in 1964. Ogden was the site of the infamous Hi-Fi murders in 1974. Flying J, the largest retailer of diesel fuel in North America, once had its corporate headquarters in Ogden. In 2009, Ogden ranked No. 5 on Newsmax magazine's list of the "Top 25 Most Uniquely American Cities and Towns," a piece written by current CBS News travel editor Peter Greenberg. According to the magazine, Greenberg based the rankings on a variety of features, such as quality of schools and proximity to medical care, as well as culture, hospitality, and scenic beauty. Tiffany's music video for "I Think We're Alone Now"
^ Van Atta, Dale (January 22, 1977). "You name it - there's a town for it". The Deseret News. pp. W6. Retrieved October 18, 2015. ^ a b c "American FactFinder". United States Census Bureau. Retrieved January 31, 2008. ^ Maia Armaleo Archived January 22, 2011, at the Wayback Machine "Grand Junction: Where Two Lines Raced to Drive the Last Spike in Transcontinental Track," American Heritage, June/July 2006. ^ "Table 1. Annual Estimates of the Population of Metropolitan and Micropolitan Statistical Areas: April 1, 2000 to July 1, 2009 (CBSA-EST2009-01)". 2009 Population Estimates. United States Census Bureau, Population Division. March 19, 2009. Archived from the original (CSV) on June 15, 2010. Retrieved October 26, 2010. ^ "History of Ogden". 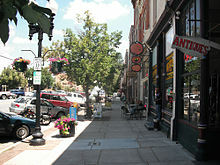 Ogden City. City of Ogden, Utah. Archived from the original on March 7, 2013. Retrieved February 12, 2013. ^ "Ogden Temple Renovation to Include Significant Architectural Facelift". includes photographs. February 18, 2010. Retrieved February 7, 2011. ^ "Ogden Utah Temple News". www.ldschurchtemples.com. Retrieved January 2, 2016. ^ a b "NOWData - NOAA Online Weather Data". Archived from the original on October 7, 2006. ^ "Population and Housing Unit Estimates". Retrieved September 26, 2018. ^ Moffatt, Riley. Population History of Western U.S. Cities & Towns, 1850–1990. Lanham: Scarecrow, 1996, 308. ^ "Subcounty population estimates: Utah 2000–2007" (CSV). United States Census Bureau, Population Division. March 18, 2009. Retrieved May 9, 2009. ^ "Ogden Comprehensive Annual Financial Report, 2010". Archived from the original on April 25, 2012. Retrieved October 18, 2011. ^ "Ogden Pride Festival". Ogden Pride Inc. Retrieved September 16, 2015. ^ "1st Annual Ogden Pride a Fun Time!". Salt Lake Pagan Society. August 1, 2015. Retrieved September 16, 2015. ^ McKitrick, Cathy (July 13, 2011). "Ogden gives green light to river development". Salt Lake Tribune. Retrieved October 18, 2011. ^ Schwebke, Scott (May 13, 2010). "Ogden's ice tower dreams melted?". Ogden Standard-Examiner. Retrieved October 18, 2011. ^ Schwebke, Scott (February 20, 2011). "Godfrey optimistic despite RAMP board's refusal to support field house funds". Ogden Standard-Examiner. Retrieved October 18, 2011. ^ Schwebke, Scott (August 24, 2011). "Godfrey wants to halt streetcar proposal". Ogden Standard-Examiner. Retrieved October 18, 2011. ^ Schwebke, Scott (July 8, 2007). "Mayor: Course won't be sold for gondola, subdivision". Ogden Standard-Examiner. Archived from the original on July 26, 2012. Retrieved October 18, 2011. ^ Davidson, Lee (November 8, 2010). "Where Utah taxes are highest, lowest". Salt Lake Tribune. Retrieved October 18, 2011. ^ "Ogden City utility rate schedule". Archived from the original on January 12, 2011. Retrieved October 18, 2011. ^ "Will crime center fight crime?". Ogden Standard-Examiner. August 2, 2011. Retrieved October 18, 2011. ^ McKitrick, Cathy (November 13, 2010). "Lawmaker, activist decry slow progress of Envision Ogden probe". Salt Lake Tribune. Retrieved October 18, 2011. ^ McKitrick, Cathy (May 26, 2011). "Coalition launches to promote ethics in Ogden government". Salt Lake Tribune. Retrieved October 18, 2011. ^ Van Valkenburg, Nancy (September 1, 2011). "Mixed bag of results in state board's school progress reports". Ogden Standard-Examiner. Retrieved October 18, 2011. ^ Van Valkenburg, Nancy (September 12, 2011). "Ogden School District seeks quieter fall". Ogden Standard-Examiner. Retrieved October 18, 2011. ^ a b Graham Lovelady. "Ogden Utah Industries". Ogden-ut.com. Retrieved October 14, 2011. ^ "Demographics of". Ogden City. Archived from the original on October 6, 2011. Retrieved October 14, 2011. ^ "Best Places For Business and Careers - Forbes". Forbes. Retrieved January 15, 2014. ^ "Business Depot Ogden (BDO) Directional Map". Ogden City. Archived from the original on October 12, 2011. Retrieved October 14, 2011. ^ a b "Utah's Largest Employers". Jobbankusa.com. Archived from the original on October 17, 2011. Retrieved October 14, 2011. ^ "About". FlyOgden. Retrieved January 3, 2016. ^ "Weber Pathways web site". Retrieved October 18, 2011. ^ Small, Laird (April 3, 2007). "golflink.com". golflink.com. Retrieved October 14, 2011. ^ "GOAL Foundation web site". Retrieved October 18, 2011. ^ Greenberg, Peter. "Newsmax Magazine Rates the Top 25 Most Uniquely American Cities And Towns". Retrieved January 13, 2014. Wikimedia Commons has media related to Ogden, Utah. "Ogden, Utah" . The New Student's Reference Work . 1914. "Ogden" . Encyclopædia Britannica. 20 (11th ed.). 1911. p. 22.